The latest Land Registry house price index shows that Craven topped the Yorkshire price rise table. Analysis of the latest Land Registry data shows that Craven and Sheffield had the highest house price increases in Yorkshire. Values rose by 9.8 per cent in Craven between January 2018 and January 2019, which is over three times the Yorkshire average rise. The average house price in the area, which includes the popular market town of Skipton and parts of the Yorkshire Dales, is now £228,330. Prices in Sheffield increased by seven per cent to an average £166,959 and highlight the continuing renaissance of the steel city. Average house prices in Sheffield are low given that it is a well-connected big city with plenty of amenities and good transport links. Close to open countryside, it has a growing number of big employers and is also regarded as one of the friendliest cities in the UK. This has led to a high student retention rate as graduates are often keen to stay in Sheffield. The average year-on-year price increase in Yorkshire was 2.9 per cent but prices saw a monthly drop of one per cent between December 2018 and January this year. Our neighbours in the North West saw an annual house price growth of 3.4 per cent with a 1.3 per cent monthly drop and the North East had a 0.9 per cent rise in prices and a 3.3 per cent monthly fall. Yorkshire’s annual house price growth is higher than the national average, which was 1.7 per cent. The average house price in the UK is now £228,147. The growth is down from 2.2 per cent the year before, making it the lowest annual growth for the UK since June 2013, when house prices increased by 1.5 per cent. The East Midlands experienced the greatest annual price rise, up by 4.4 per cent, and London saw the largest annual price fall, down by 1.6 per cent. 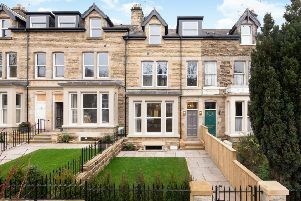 Despite a drop, Harrogate remains popular with buyers and is the most expensive place to live in Yorkshire. The average home costs £277, 208. The cheapest place is Hull, where the average home is £113,863. In January 2019, the most expensive area to live in was Kensington and Chelsea, where the cost of an average house was £1.4 million. In contrast, the cheapest area to purchase a property was Burnley, where an average house costs £78,000. While the market remains subdued due to Brexit, government figures for January 2019 show that on a seasonally adjusted basis, the number of home sales with a value of £40,000 or greater was 101,170. This is 1.3 per cent higher than a year ago. Between December 2018 and January 2019, sales increased by 0.8 per cent. The Bank of England’s figures show that mortgage approvals for house purchase increased in January to 66,800, slightly above the average of the previous six months of 65,500. Detached homes saw the greatest price growth at an average 2.4 per cent, semi-detached homes grew by 1.4 per cent, terraced houses by 1.4 per cent and the average price of flats fell by -0.6 per cent. The value of apartments is skewed by a fall in London prices as about 30 per cent of England’s flats and maisonette transactions are in the capital. The number of first-time buyers increased by 1.3 per cent between January 2018 and January 2019 and the average price they paid was £191,799. *Here are the Land Registry Yorkshire house prices rises and falls over the year from January 2018 to January 2019, along with the average house price: Barnsley 1.3 per cent (£118,589); Bradford 1.1 per cent (£134,183) ; Calderdale 1.5 per cent (£139,322); Hull 3.3. per cent (113,863); Craven 9.8 per cent (£228,330); Doncaster -0.7 per cent (£123,062); East Riding 1.9 per cent (£177,944); Hambleton -0.6 per cent (£231,056); Harrogate -2.1 per cent (£277,208); Kirklees 1.3 per cent (£148,301); Leeds 3.7 per cent (£185,198); North Yorkshire 0.3 per cent (£218,718); Richmondshire 2.7 per cent (£207,373); Rotherham 6.3per cent (£141,537); Ryedale - 0.7 per cent (£228,384); Scarborough 0.4 per cent (£164,480); Selby -0.1 per cent (£197,570) per cent; Sheffield seven per cent (£166, 959); Wakefield 3.9 per cent (£149,122); York 5.5 per cent (£254,591).